Is it possible to change the color of your Custom Label for each logical disk to relfect the health state. Essentially, using IF statements and some HTML allows you to do this for the SLA tile, though I’ve not tested this on a performance/status tile. 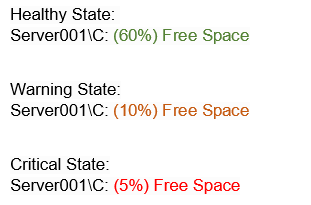 It also doesn’t appear as though space used is not a property against a disk, so this wouldn’t be possible. To be honest though, if these thresholds are set in SCOM, the object health will show as Healthy/Warning/Critical when the thresholds are breached. It seems a superfluous to do this extra level.